The original for this recipe came from http://www.thekitchn.com. We used it for the March/April 2017 birthday party in Cedar Valley. Line a baking sheet with aluminum foil and set a cooling rack on top. Lay the ribs on top of the rack in a single layer. This arrangement allows for heat circulations on all sides of the ribs. Mix the mustard and the liquid smoke, if using, and brush the ribs on both sides. Sprinkle the ribs with the dry rub and pat gently to make sure the rub adheres to the rib meat. Note: This step can be done the day ahead for a deeper flavor. Wrap the seasoned ribs in plastic wrap and refrigerate. Heat the broiler and place an oven rack a few inches below the heating element. 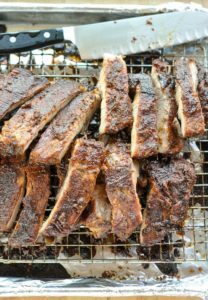 Make sure the meaty side of the ribs is facing up. Broil the ribs for about 5 minutes, until the sugar in the dry rub is bubbling and the ribs are evenly browned. Set the oven to 300°F. Move the ribs to an oven rack in the middle of the oven. Roast for 2 1/2 to 3 hours for spare ribs or 1 1/2 to 2 hours for baby back ribs. Halfway through cooking, cover the ribs with aluminum foil to protect them from drying out. About 30 minutes before the end of cooking, brush the ribs with barbecue sauce, re-cover with foil, and finish cooking. The ribs are done when a knife slides easily into the thickest part of the rib meat. Let them rest, covered, for about 10 minutes, and then cut between the bones to separate the individual ribs. Serve immediately with extra barbecue sauce for dipping.